Azalea plants are one of the most colorful and popular ornamental shrubs that lend a striking beauty to one's landscape. Part of the genus Rhododendron, these spring bloomers have been around since the 1830s and have developed into some 10,000 different cultivars. The flowers are most notably native growers to North America, Europe and Asia and hold sentimental value to numerous regions around the world. For example, the azalea plant has long been a symbol for the city of Sao Paulo, Brazil. The azalea is also Georgia's state wildflower, and the plant is celebrated across the United States in many festivals. Although the azalea and rhododendron are considered sisters, both plants display distinctions in their flower appeal. You will generally find azalea blooms as funnel shaped and with five stamens. The rhodo features bell shaped flowers with 10 or more stamens. The intensity of an azalea plant bloom can turn many heads, because the color variety offers something for everyone. There is white, pink, purple, mauve, salmon and all variations of red, orange, and yellow. Like all plants, the azalea has growing preferences, but according to the Azalea Society of America, these beauties can handle a variety of conditions. Experts suggest that most azaleas are hardy to planting zones 6-9, with a few varieties being able to survive the colder temperatures up to a zone 4. Most azalea types welcome partial sun or filtered shade under tall trees. Too much sun can burn the leaves and not enough rays can restrict blooming. When it comes to soil, forget clay or alkaline, because azaleas don't care for these extremes. 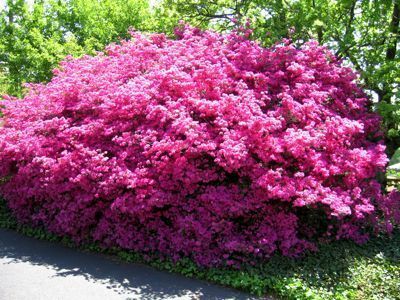 Instead, plant azaleas in loam, which contains both small and large particles for better drainage and oxygen absorption. Shallow roots mean that azaleas need a moist, well-drained soil. Their foliage also allows for water absorption, so it's suggested you wet both the leaves and root zone when you water. Ample water is a good thing for maintaining azaleas. Mulch is beneficial in keeping your azalea healthy, and about three inches in thickness placed as a ring around the plant is best. The U.S. National Arboretum advises using shredded leaves, leaf mold, pine needles or pine bark mulch for excellent results. Stay away from shredded hardwood, as it can create a high pH soil level. If you're looking to enhance your property with a strong and stunning shrub, consider the azalea plant.